If you couldn't guess already, I made the last few Japanese recipes all the same night. Though, after cooking for hours and then posting maybe one recipe, I get either writers block or just want to relax. I never want to post something that is too trying and not genuine! Plus, would you really want to read it??? That's what I thought! So, I received the ultimate compliment when it came to this vegan maki roll. "Oh my (bleeeeeeep), why can't restaurants serve rolls like this? Maybe then I will crave some vegan sushi." (Insert a big ole' blushing dimple face here). But in all seriousness, this is a dream come true for your taste buds, especially f you have a love and/or obsession for truffle oil and/or shitake mushrooms. And, if you love both, this is a gosh darn double wammy, dream come true! Opposed to my last sushi recipe, where we rolled an inside out roll (rice on the outside), we are going to start with the nori as the first layer. Then you will lightly spread your sushi rice evenly on the nori. Remember, lightly oiling your hand helps to prevent rice to sticking to your hand. Soak your dried shitake mushrooms in hot broth or hot water for at 30 minutes. In the meantime, prepare your microgreen salad. Simply lightly toss the microgreens with rice wine vinegar and a touch of truffle oil. Place rehydrated shitake mushrooms down the middle of the rice and nori, drizzle with some truffle oil, and then add in the microgreens. Roll accordingly, cut into pieces and serve! If you are familiar with Japanese cuisine, I am sure you have seen gyu-negimaki on the menu. And, if you are not savvy in Japanese food items, it is simply boiled beef, marinated in teriyaki sauce and wrapped around scallions. But I also wanted to play around with the recipe and use asparagus as well. Clearly we are not using beef here. Instead, you are going to use boiled seitan (or your favorite store bought seitan). If you are gluten free, try marinating some tofu skins instead. 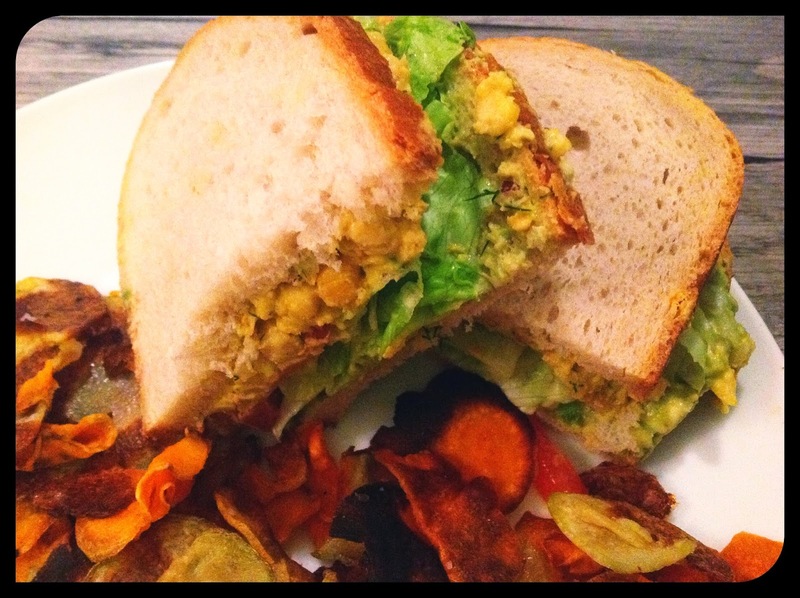 Start off with this simple seitan recipe if you choose to make your own. 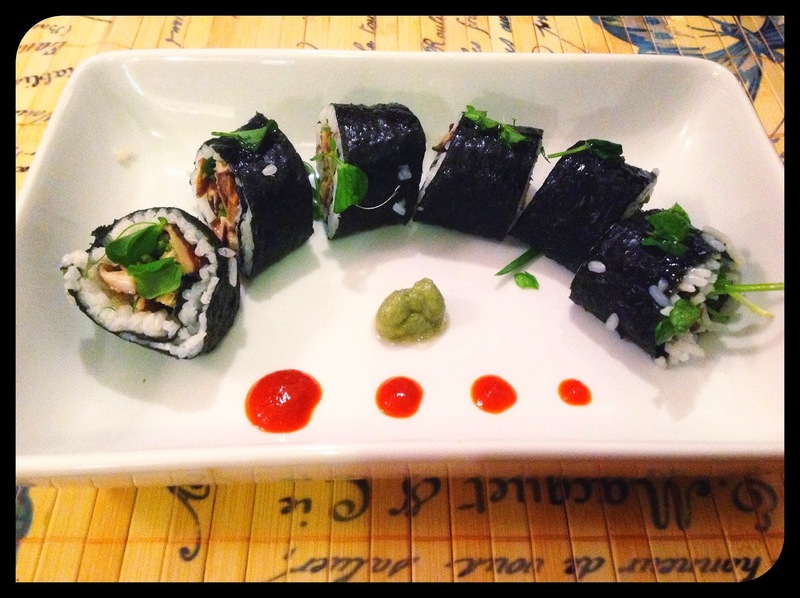 These are great to accompany some traditional or not-so-traditional vegan sushi rolls. Also great for fingerfoods, picnics, etc. Cut seitan into very thin strips. Place the strips in the teriyaki marinade for about 20-30 minutes. Once marinated, remove the strips and gently pat with paper towel, and turn heat on a saute pan or turn on your brindlille/foreman grill. 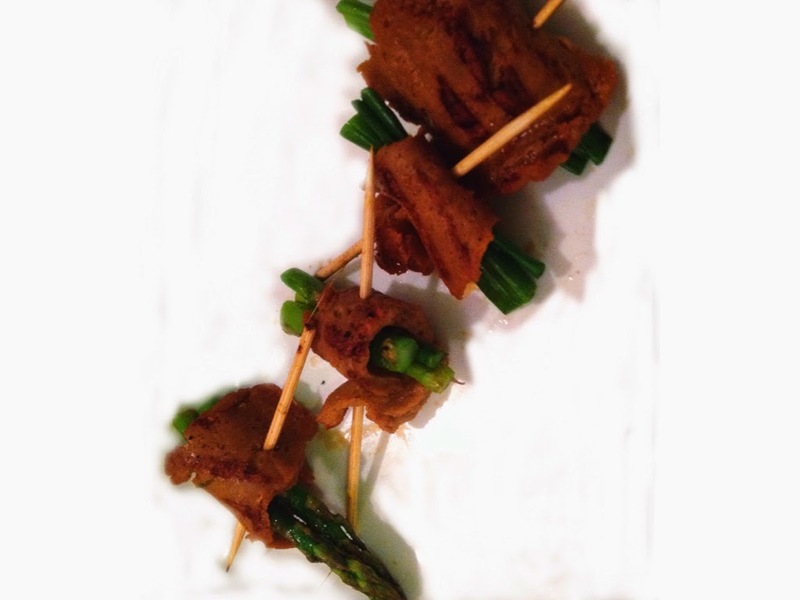 Wrap 2 pieces of asparagus of 3 pieces of scallions with the seitan strips. Cut the scallion/asparagus to the size of the seitan strip. Repeat until your vegetables are wrapped. You may need a toothpick to secure. Quickly brush any additional marinade on your wrapped veggies and saute or grill for about thirty seconds. Garnish with sesame seeds. Serve hot or room temp! I used to frequent a popular byob sushi spot in Chicago somewhat often. Ever since, I have wished that every sushi joint carried that ever so memorable roll. Being vegan, it was a delightful change rather than the typical veggie roll. Come on peeps! 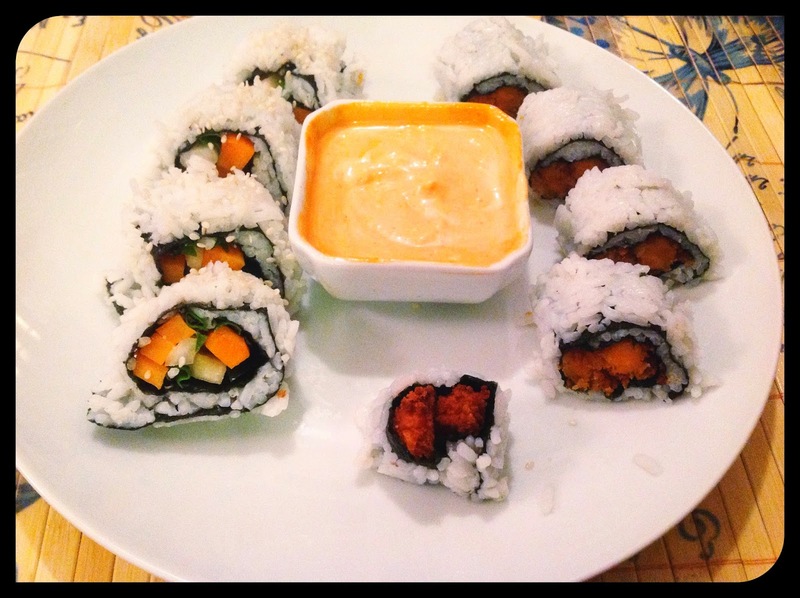 You can be creative with a veggie maki roll! So basically this is a tempura battered sweet potato roll with a touch of heat. I did not have soda water so I strayed a bit from a traditional tempura batter recipe. For step by step directions, visit my standard veggie roll recipe. But some tips not to ignore are the follows: 1.) Make sure you cover roll sushi rolling mat with a large zip lock back or cover in plastic rap. 2.) Oil your hands when laying down the rice will prevent you having a sticky mess on your hands. 3.) Rice wine vinegar plays an important part when preparing your sushi rice! enough oil to pan fry battered sweet potato. Start boiling a pot of water. Wash, scrub and peel the sweet potato. Very carefully, cut the sweet potato lengthwise into about 1/4 inch thick pieces. (think about how they should look while you are rolling your maki- that may help). At this point, your water should be boiling. Steam the sweet potato for about 5 minutes or until semi soft. You do not want it mushy! Set aside to cool. In a small bowl, whisk together the agave nectar and chili oil. Brush the marinade on the sweet potato. Allow to cool completely. Once cooled, make your batter. mix together everything but the panko crumbs. Make sure the mixture is pretty thick. Then, set up a plate with your panko crumbs laid out. Drench each slice of marinated sweet potato in the batter and then cover completely with panko crumbs. Repeat until each slice of potato is coated. Heat about an inch of oil in pan fry your battered sweet potato pieces until golden brown. Remove from oil and place on paper towels to dry. (surprisingly crispy and NOT greasy). Now it's rolling time. Flatten out rice on your plastic covered, place nori on top, then add in the crispy sweet potato strips. Roll accordingly. Repeat until the sweet potato strips are finished. Serve with a spicy mayo. Happy eating! Calling all vegans! You can have your steak and eat it too! I love this freakin recipe. 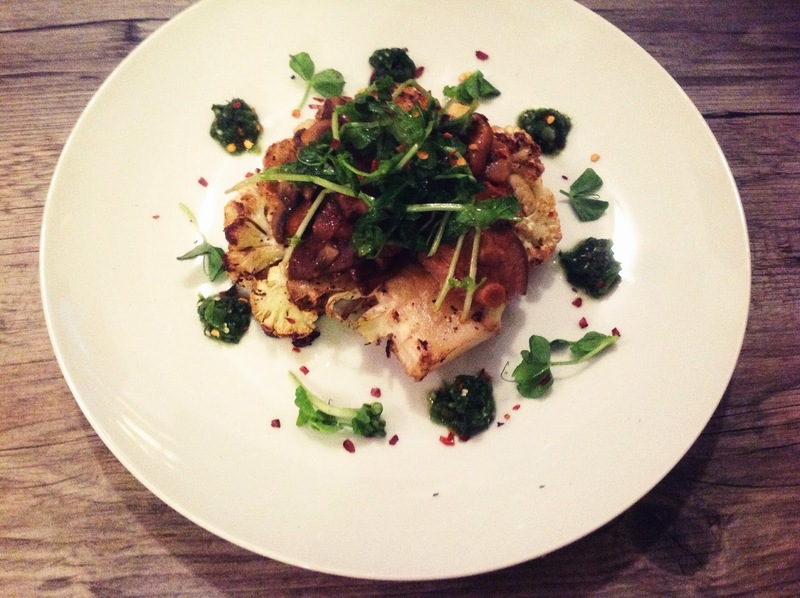 If you haven't made a cauliflower steak, it is a must try. Even non-vegans will love it! It is tasty, satifying and filling. A friend asked me a few months ago, "What do you think about while you give massages?" It is a pretty valid question seeing as that I am working on bodies for 6 hours, typically in silence. And, it is an interesting question because sometimes you are very in-tune with a client and their energy. In that case, my mind does not drift into vegan la-la land. In other cases...well....I am clearly drilling my mind to come up with new recipes. Hence this creation. I had some chimichurri sauce that I used for my Chimichurri Spiked Tabbouleh. I thought it would be a nice contrast to the rich truffle mushroom ragout. Balance is key in every recipe! Heat evoo in a saute pan and heat on medium-high heat. Sear each side of the cauliflower steaks until they are charred on both sides (about 3-4 minutes per side). Transfer steaks to a lightly oiled baking dish and bake for 15-20 minutes. In a saute pan, heat evoo and saute onions, garlic and parsley for about 3-4 minutes, then add in mushrooms. Saute for another 5-10 minutes. Add in wine and allow to boil for a few minutes until most of the liquid is evaporated. Add in broth and tomato paste and stir until the tomato paste is completely disolved into the liquid. Cook over medium heat until the liquid is a thick sauce consistency. Add in truffle oil and season to taste. Pour over you cauliflower steaks. And serve with you chimichurri sauce and some fresh micro greens! Tabbouleh is one of my favorite Mediterranean salads. It is great for a side and/or for a light lunch. And don't forget, it is a great accompaniment to a delicious falafel recipe. 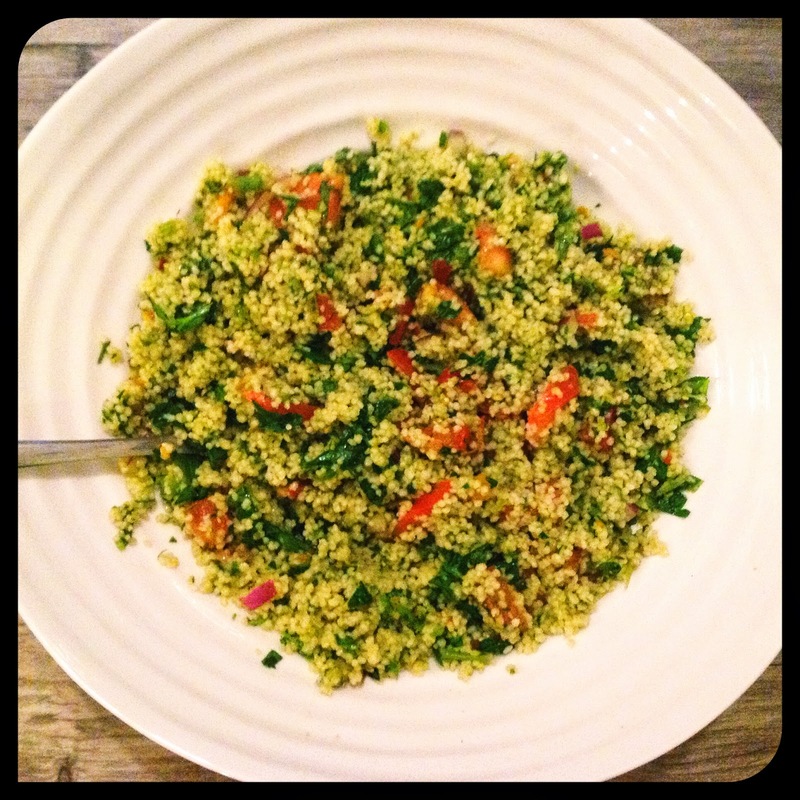 I wanted to take a traditional tabbouleh recipe and have some fun with it. Lets face it, most people know how to make a traditional Mediterranean salad. 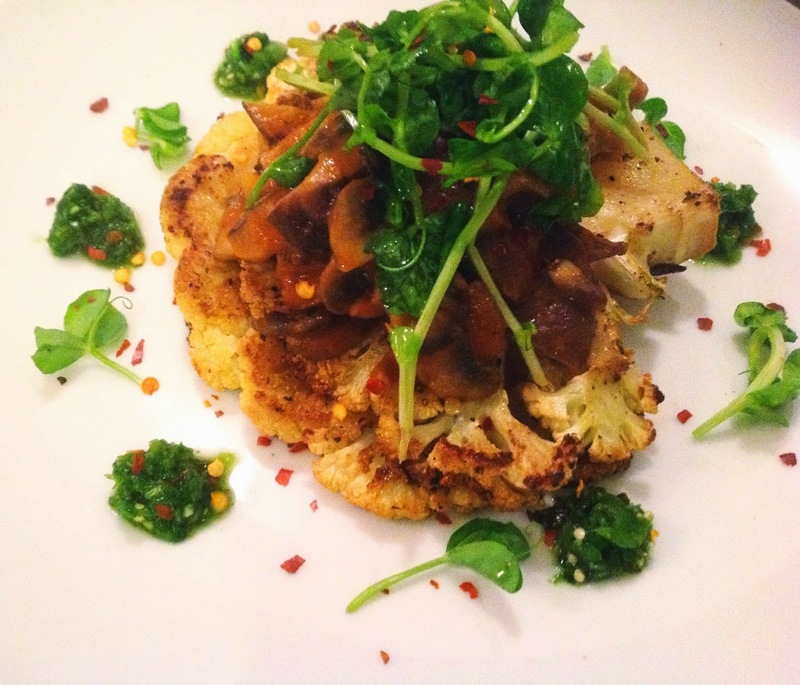 And then, a little light bulb went off in my brain as I was making a hearty cauliflower steak tonight.....why not blend Mediterranean with Argentinian flavors....duh??? Okay, okay.....if you couldn't guess what the secret sauce in the newly inspired tabbouleh dish is....drum roll please.....it's chimichurri sauce!!! 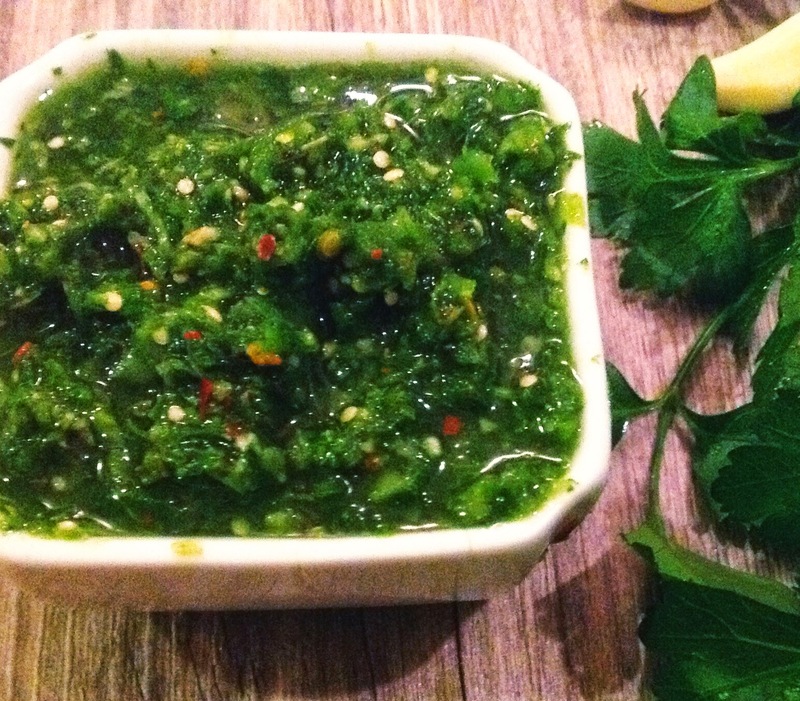 If you are not familiar with a chimichurri, it is an Argentinian sauce that is typically used as an accompaniment for grilled meat. 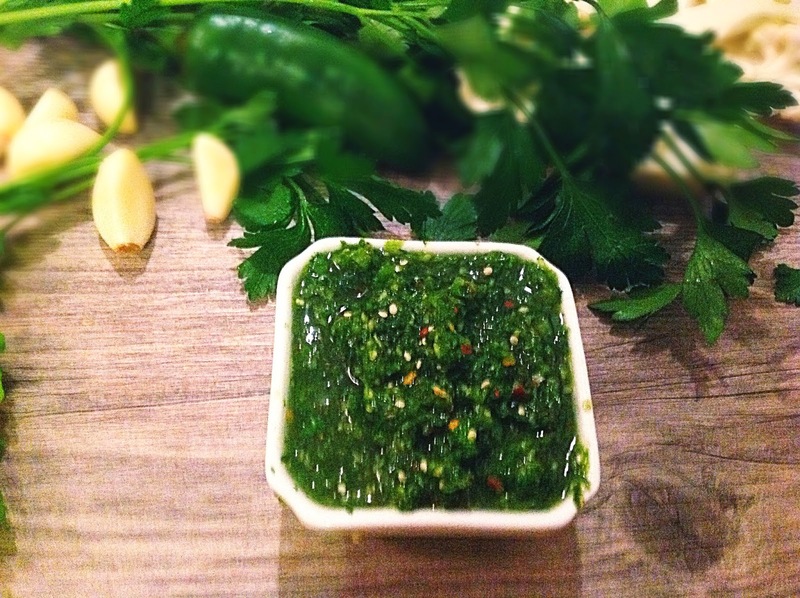 Usually it is made of fresh herbs and spices and has a gorgeous, vibrant green color. Boil water and add in couscous. Cover and remove from heat. Allow to sit for 5 minutes, then fluff with fork. Add in remaining ingredients and set aside. 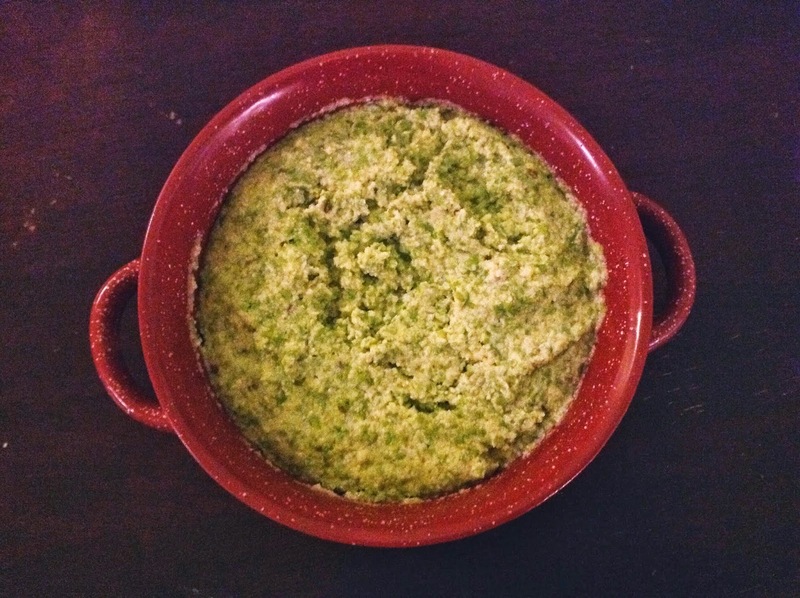 Take all the chimichurri ingredients and blend in a food processor. Add more liquid if needed. Season to taste. Spoon in the chimichurri sauce to your tabouli....enough to coat all the tabbouleh salad. Let sit at room temperature to absorb all necessary flavors! Thank goodness it is finally starting to feel like spring! See ya later heavy, hearty soups...hello fresh new flavors! 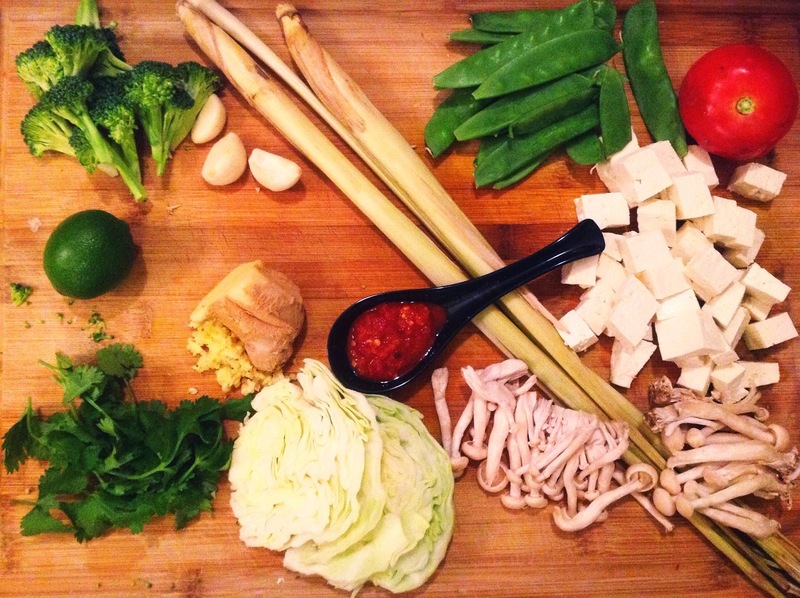 Fresh vegan spring rolls and a bowl of veggie tom yum soup??? Um, yes please! That was exactly what I used to order for delivery years ago from our favorite Thai place in Chicago. The two go perfectly together....fresh, zesty and vibrant! And then, I had an epiphany....why am I spending so much money on take out when I can do it just as good (if not better) myself? Bye bye $35 delivery and hello homemade Tom Yum Soup!!! Basically, there are two variations to this....you can either have a clear broth with just lemongrass, galangal (or ginger), garlic and chili paste, or you can add a touch of coconut milk. Coconut cream gives it that creamy texture and savory slurp. And who doesn't love a slurp like that??? Have fun with this recipe! There are no wrong or right things to put in it! Go crazy if you wish! Though, tofu, exotic mushrooms, cabbage and snap peas are a must in my book! Take your lemongrass and peel off the outside skin. Cut the stalks into 1/2-1 inch pieces...the lemongrass is what is going to give the soup that bright and fresh taste (note do not cut into small pieces, as you will be discarding the pieces later on). In a large stock pot, heat evoo and saute garlic and ginger for about 2 minutes. Add in vegetable broth, along with lemongrass pieces and chilis and bring to boil. Cover and simmer for about 10-15 minutes. Taste your broth at this point. 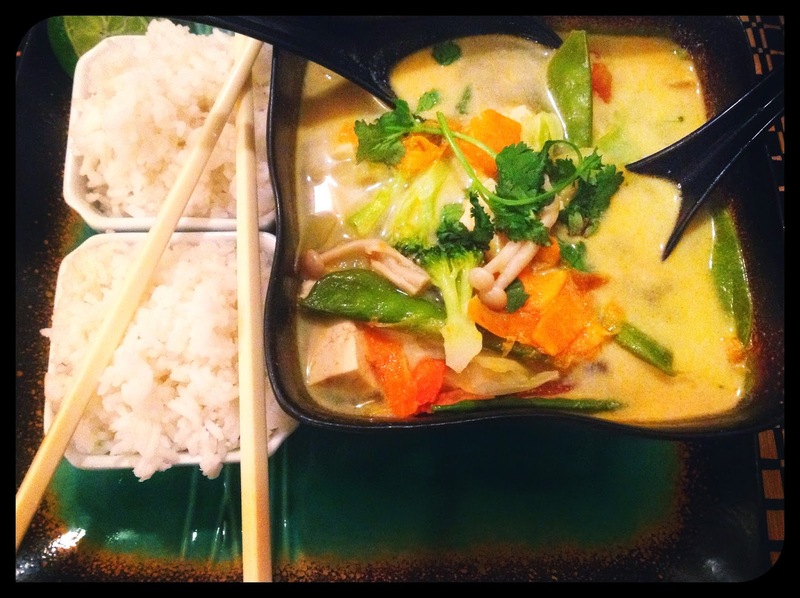 You should get that bright flavor of lemongrass. If it is not apparent, allow to simmer for another 10 minutes. With a strainer, remove the lemongrass pieces. Stir in chili paste. Add in your veggies and tofu. Note that you do not want the veggies to sit in hot broth for too long. You want your green vegetables to remain vibrant and fresh! Serve with cilantro as garnish and rice! P.s- don't forget your spring rolls! Yeah yeah, I know....I feel like when people hear the work "fermented" they kind of cringe. I am not really sure why. Maybe it is an acquired taste??? After all, I hated kombucha the first time I drank it. It was pungent, fizzy and just didn't appeal to my palate. But, as we grow, we evolve, as do our taste buds. Mung beans are most prominent in Asian/Indian cultures and high in nutritional value and content. And when fermented, that value increases even more!....rich in enzymes, improves digestion, increases flavor and shelf life, restores proper bacteria balance in your tummy, increases nutrients....I mean the list goes on. Unlike other fermentation processes, this one is quite simple: soak, blend, soak again....just about one and a half/two day span. 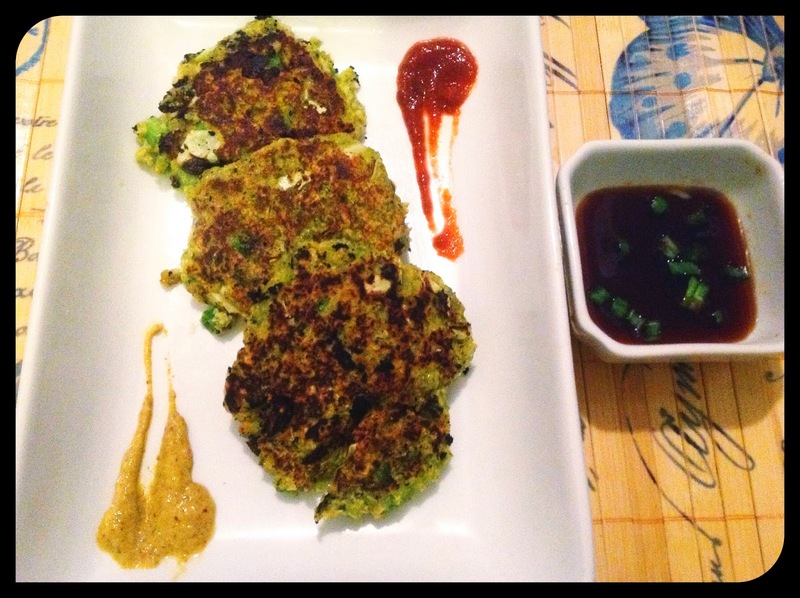 This recipe is non-traditional to the korean style fermented mung bean pancake. Though, I will do another version of the pancake that is inspired by the korean recipe. Here we are not using kimchi. Instead, I used fresh vegetables to mix into the fermented and blended mung bean mixture. fermented for another 12 hours. Rinse your mung beans and discard any that look bad or discolored. 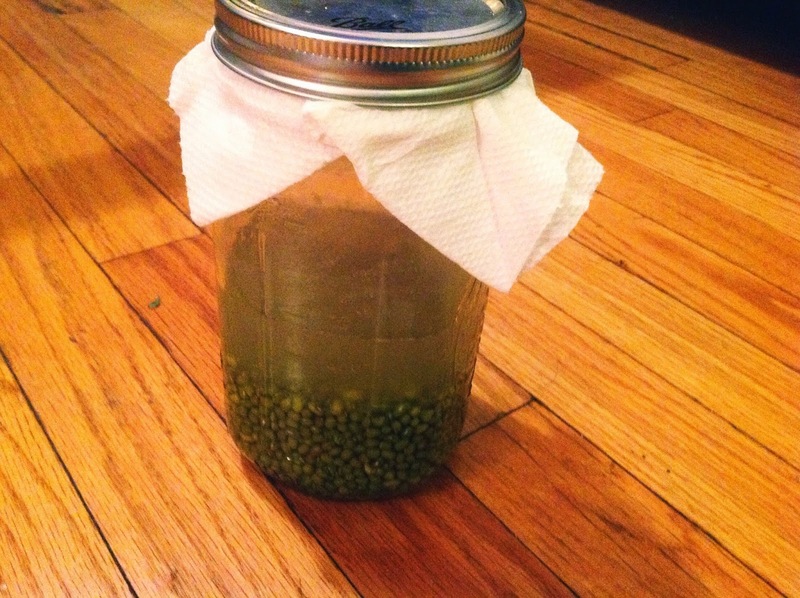 Place mung beans in a mason jar and cover with about double the amount of water (the beans will expand over night). Make sure you used pure, filtered water! Cover with a cheese cloth (or paper towel if you do not have) and twist on top. Let sit out on counter overnight. In the morning, rinse the mung beans (you may want to save your fermented liquid for the next time you ferment because you now have bacteria in the water and will speed up fermentation process!). Transfer beans to food blender and add a few tbsp of water, just enough to blend but you do not want smooth! Transfer to a bowl or container, cover and let sit to ferment for about 6+ hours. After those six hours, it should look a bit foamy and bubble- I suppose that is the best way to describe it. Now, transfer the blended fermented mixture in a bowl and add all above ingredients, except for the evoo. Mix together and season to taste. Heat evoo or sesame oil on medium heat. Add about 2-3 tbsp to the saute pan for each pancake. Cook each side of the pancake for about 3-5 minutes or until crispy and brownish. Continue until batter is done. Serve with a spicy Asian mustard, Sriracha or sweet-soy/scallion sauce! Come and get a slice!.....Vegan Key Lime Cheesecake! 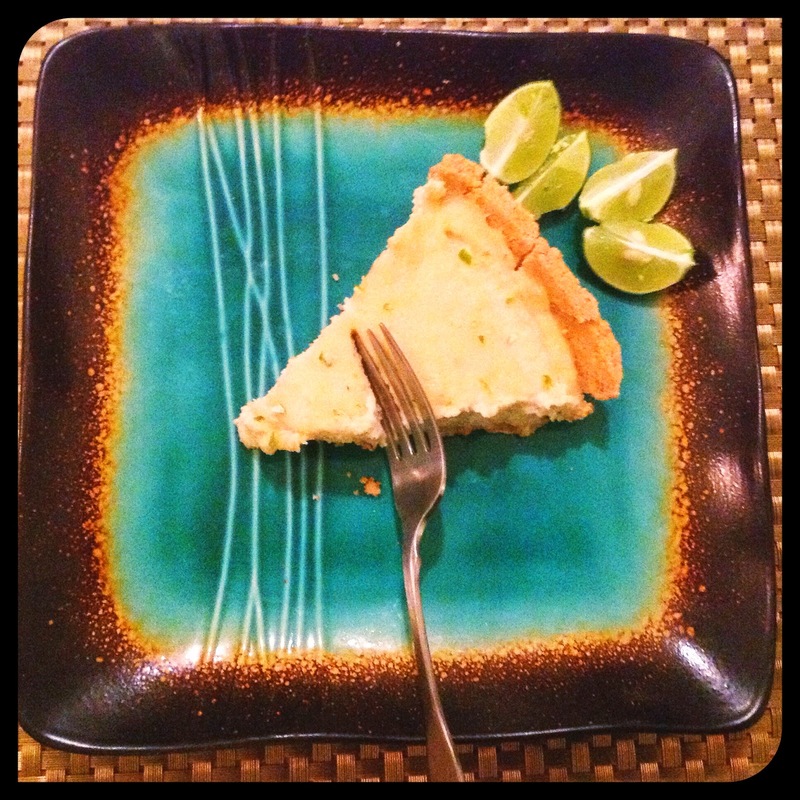 I was just going to call this key lime pie, but I really think that it resembles more of a cheesecake. Smooth, silky, creamy, lusciousness with the brightness of key limes. I couldn't think of a better dessert to enjoy when you are not in the mood for something chocolatey or heavy. I made this with soaked cashews. But, you could also make this vegan cheesecake with tofu. For some reason the idea of using tofu in desserts does not sit right with me. I suppose it does make sense though because of the smooth texture and bland taste. After you have soaked your cashews, drain and rinse. Throw into the food processor with all of the ingredients listed, except for the graham cracker crust. Continue to blend until completely smooth. Note: you may need to add in more coconut milk or coconut oil to achieve the perfect consistency. 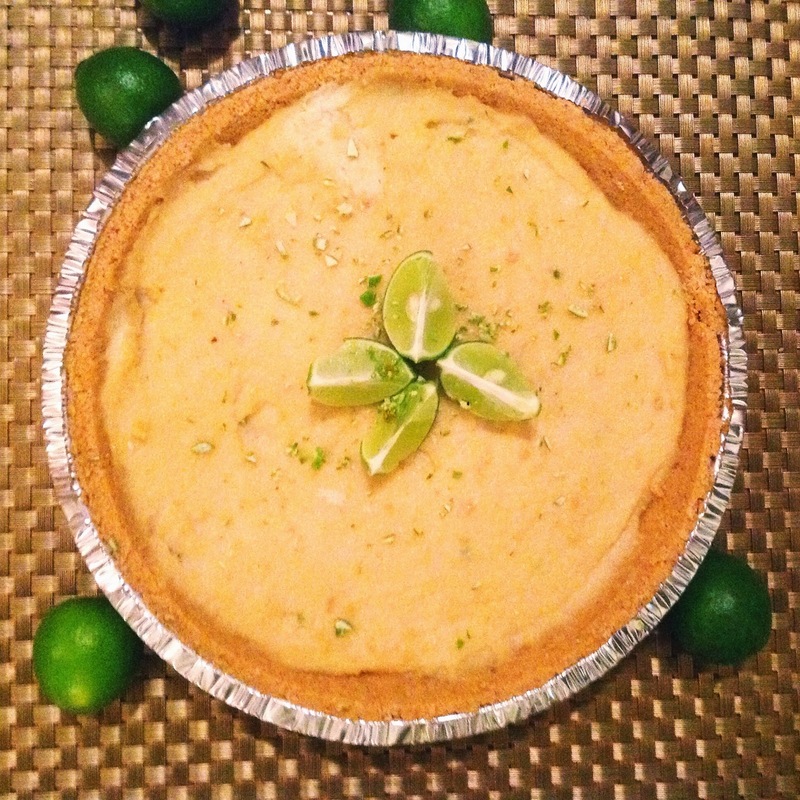 Sprinkle the additional key lime zest on top and refrigerate until ready to serve. Once smooth, pour into the crust and smooth out evenly. I have recently read about the difficulty our bodies have breaking down beans and legumes. Lentils, mung beans and peas are some of the easier legumes to digest. Whereas, pinto, kindney, garanzo, navy and black beans are a bit more difficult and should be eaten less frequently (this kind of broke by heart). And, the most difficult to digest are soy and black soybeans. Note- this does not include soy products, such as tofu, tempeh, etc. So, with that said, I have started to soak/ferment the beans before actually cooking them accordingly. What this does is promotes the sprouting process and eliminates phytic acid. In return, we are able to absorb much more vitamins and easily digest them as well. There are also ways to reduce gas and bloating, but I will touch upon that in another post. I just thought that was pretty interesting! Now, on to the yummy good stuff! 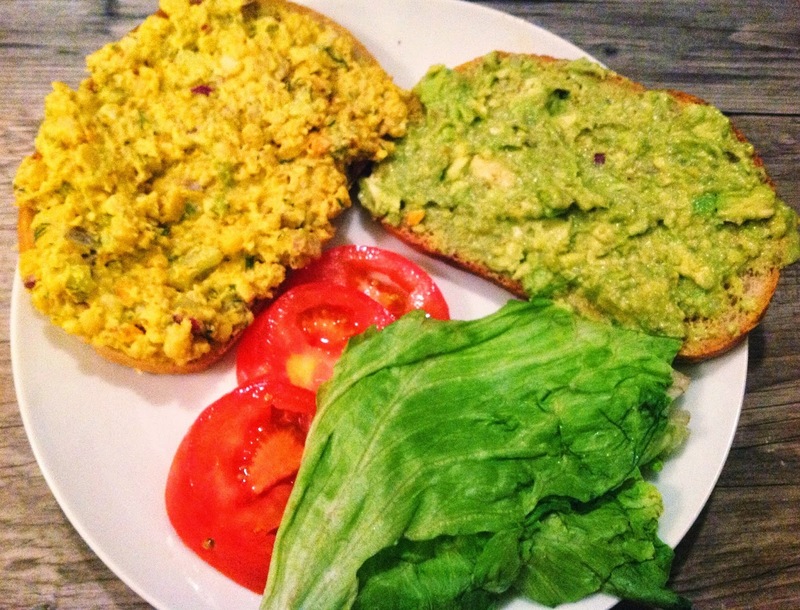 This chickpea "egg salad" really tastes like true egg salad! The grated fresh turmeric root and chopped fresh dill is delicious in this recipe! I also added in some avocado spread with lime juice to give it another textural element. Note that this is a pretty hearty sandwich. While I prepared this for Ryan on sprouted Rye bread, I preferred mine on a nice spinach wrap. Much lighter and better for me! If you choose to soak your chickpeas, do this 24 hrs in advance. Cover chickpeas with about doubled the amount of water. Use bottled water or filtered water. Once soaked, rinse and bring a salted pot of water to a boil. Add in garbanzo beans, cover and simmer for 45 min-1 hour. When done, rinse again. It is normal if there is a slimy substance coated them. This is why you rinse. Transfer beans to bowl and mix in veganaise, mustard, lemon juice, dill, turmeric, celery and onion. Season to taste, and add in more vegan mayo or mustard if you desire. Smash the mixture with a masher. You want the consistency to be half mashed, half somewhat in form. Now just form your sammy accordingly! 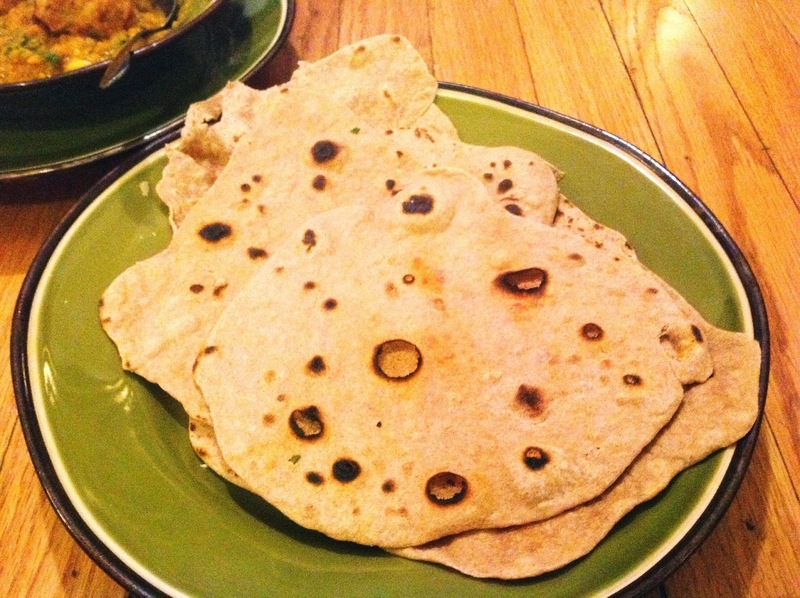 If you are making an Indian entree dish, you must know how to make roti, aka chapati! It is so flippin' easy, it is an actual must! When thinking about making bread of any sort, it seems like such a task! All the kneading and baking and worrying.....did I do that correctly? Well all of that can go right out the window when making roti! It is unleavened bread, so no need of yeast and such. Just whole wheat flour, water, evoo and a touch of salt. Roll that babies out flat and thin and throw on a heated skillet for 2 minutes. I mean, hot damn, this stuff is easy AND delicious! I like to jazz my roti up with some sea salt and fresh garlic. Next time I maybe even be a bit more adventurous and add in some other herbs or scallions...ooooohhhhhh weeeeeeee! In a bowl combine the top 4 ingredients. Knead the dough with your hands for about 10 minutes. Preheat a skillet on med-high . Note you are not using any oil on the pan! Divide your dough into 10-12 sections. Roll each section into a ball, then roll thin with a rolling pin. Gently sprinkle sea salt on top of each piece and press in pieces of garlic as well into dough. Cook each side of the roti for about 1 minute. Small darks spots will appear at the end. Enjoy with your favorite Indian dish! 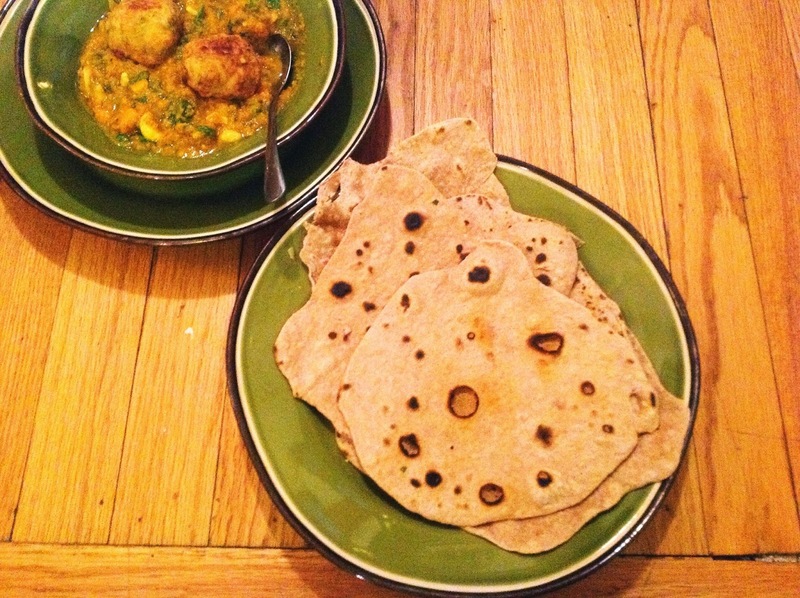 I prepared this with Vegan Lauki Kofta.